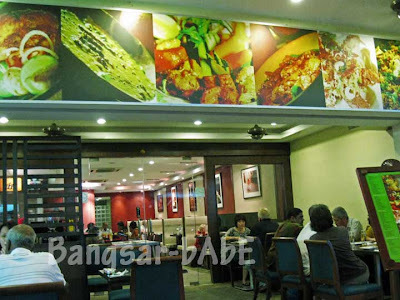 D.F told me about this place that serves good Indian food in Bangsar called Indian Kitchen. Curious, I decided to try it for dinner yesterday. At Indian Kitchen, you have a choice of dining inside with air-conditioning or al-fresco, for some people watching. Prior to this, I had the perception that Indian Kitchen was a high-end Indian restaurant that would burn a hole in my wallet. As I looked through their extensive menu, I realised I was wrong. The prices are quite reasonable. Shiva (the restaurant’s director) recommended a variety of their specialty dishes for us to try. We started off with the Masala Papadam and Tandoor Papadam. 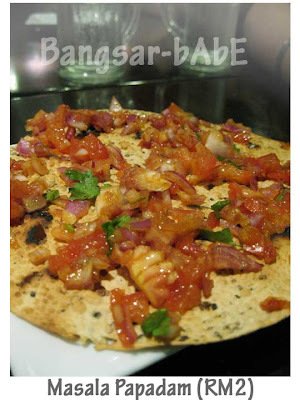 The former was a robust combination of chopped onions, tomatoes, cumin and some spices on top of the crispy spice-flavoured papadam. 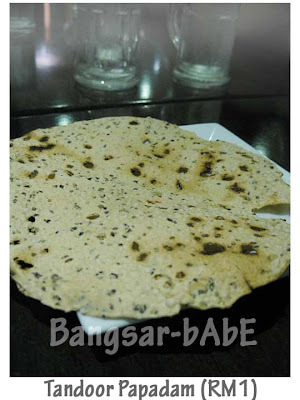 The Tandoor papadam was very fragrant and a taste bud teaser! 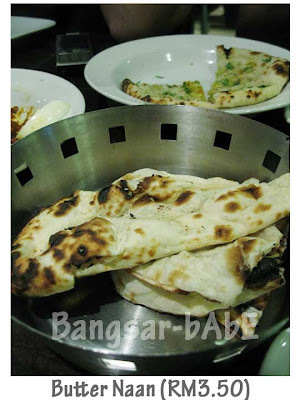 Our order of garlic naan (RM3.50), butter naan, cheese naan (RM4) and palak paneer came soon after. Followed by the Chicken Amritsari (not in the menu) and Dhal Palak, which were highly recommended by Shiva. The naans were soft, fluffy and did not leave you with a “flour-y aftertaste”. Very nice. My favourite was the garlic naan. 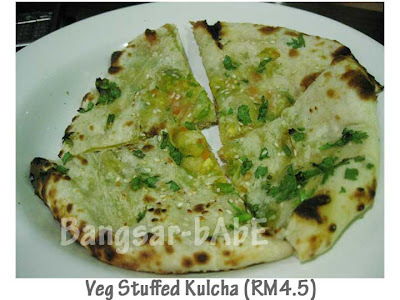 We also ordered two Stuffed Veg Kulcha which were also very aromatic and tasty. Taken from wikipedia: “Kulcha is a north India bread, usually eaten with chole. 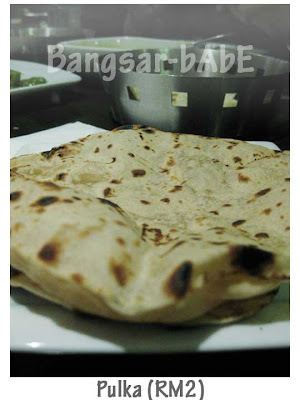 It is typically made with Maida flour.” The Chicken Amritsari vowed us all. Tender chicken chunks cooked with thinly sliced onions, garlic, chili, finely chopped coriander and Indian spices, it was our favourite dish that night. Tangy, spicy and slightly creamy, it was the perfect accompaniment to the naan. Palak Paneer is a North Indian dish prepared with spinach and Indian cheese. This was probably one of the best Palak Paneer I’ve had so far. The rest nodded in agreement, with their mouths full. It was rich, smooth and creamy, with soft paneer cubes and lightly seasoned with Indian spices. 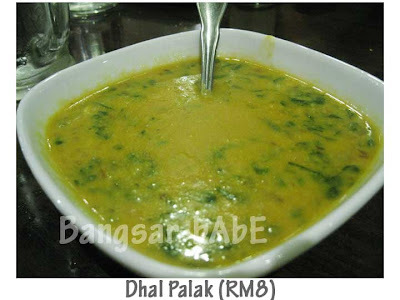 Also noteworthy was the Dhal Palak (lentils with spinach), one of Indian Kitchen’s specialty. 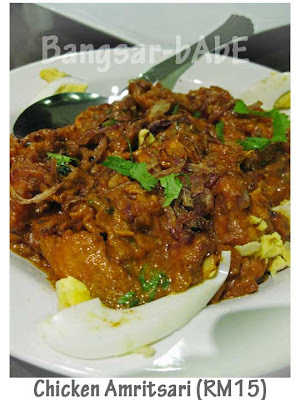 Thick, hearty and slightly spicy, it is great for those who can’t take too spicy food. 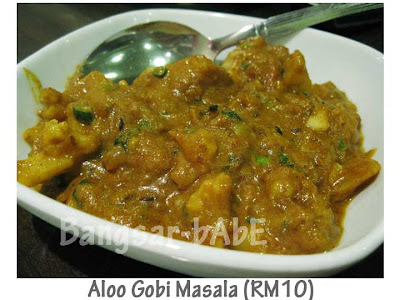 We also ordered the Aloo Gobi Masala. It is a spiced potato cauliflower dish cooked with chili powder, cumin, turmeric powder and coriander. The cauliflower was tender and the potatoes were soft but not mushy. I love spicy food so this dish hit homerun with me. I initially wanted to order the tandoori chicken, but Shiva sang high praises of the Afghani Kebab (not in menu) so I decided to give it a try. I’m glad I did, as it was absolutely scrumptious! 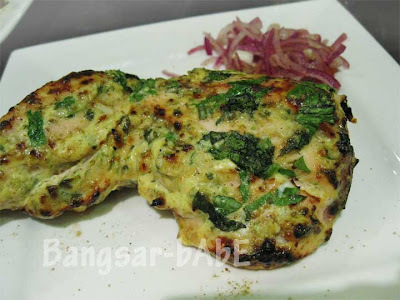 Lightly marinated with fragrant spices, the chicken was tender, juicy and full of flavour. I literally picked the chicken right to the bone! We also had the Tandoori Roti and Pulka on the house. The Pulka was very similar to Poori, but a heavier texture. I didn’t get to try the Tandoori Roti, but according to rif, it was very much like naan, but lightly flavoured with spices. Just as we were finishing our meal, Shiva served us some Sweet Kesari, again on the house. He was also very apologetic about the slightly slower service (it was a very full house). I enjoyed the kesari immensely. 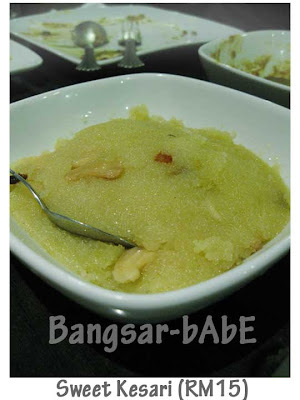 Semolina, ghee, raisins and cashew nuts cooked with milk, sugar and salt (they cut down sugar). It was creamy and had just the right sweetness. According to Shiva, they use unadulterated cow’s milk in their cooking, to ensure good quality and great taste in their food. 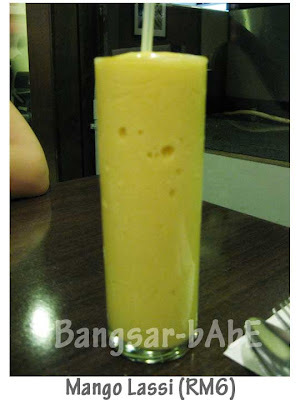 My mango lassi had a thick, puree-like consistency which Jeen described as “very mango-ey”. rif tried it and said it was nice. I agree with him. The lime juice (RM3) that Jeen ordered was zesty and light. I liked that they blended the ice on the top, so it was a bit like slush. If you want good Indian food in a clean, comfortable environment, give Indian Kitchen a try. Prices are reasonable so you don’t have to worry about burning a hole in your wallet. Dinner came up to RM98 for the 6 of us. Thank you Shiva for all the delicious food and for your generosity. Everything was simply delightful! 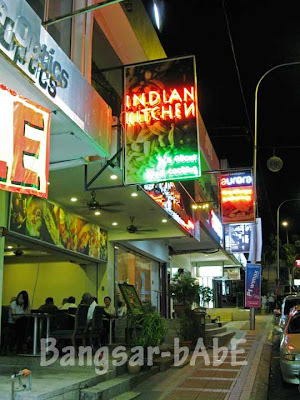 * Vitya who knows a lot of Indian restaurants in KL says that Indian Kitchen is one of the better ones around. And she’s extremely particular about good Indian food, so is D.F! Verdict: This is the place for good quality and tasty Indian food. I think Indian Kitchen’s palak paneer and naan is nicer than Anjappar’s. Love your blog. Very detailed analysis of everything you eat! plus like the fact that you attempt to put prices on most items wherever you can. Great indication on the value of the food. I am originally from Penang, but am currently working in the UK as a doctor. I have tried different types of indian/pakistani/bangladeshi food in the UK and particularly in Glasgow. There seems to be more oil used in most south-asian food served here. 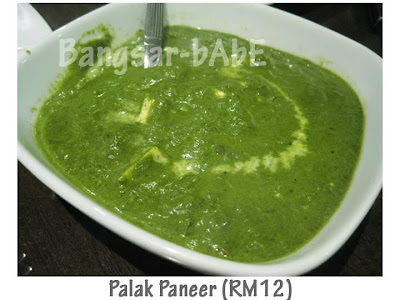 The palak paneers I have tried for example have a thick layer of oil at the top-which disperses when mixed with the minced spinach. They seem to be more intense in colour as well and less creamy (compared to the photo you took). In a way, I suppose the UK version of it may be just slightly more unhealthy then the Malaysian one. Anyway, just an observation and would love to hear your thoughts on this. I tried some Indian food in London and Bedford while I was studying there, but not enough to judge the difference between what we have here and in the UK. If I remember correctly, the Indian curries (such as tikka masala and rogan josh) in the UK are spicier than the ones we find in KL. The owner of Indian Kitchen is extremely particular about the oiliness of his food, much to the pleasure of his customers. He trains his chefs to use only enough oil, and uses quality sunflower oil. None of his food has added colouring or MSG. They get the flavours and colours from natural ingredients and spices. The palak paneer from Indian Kitchen has a very light green hue, a sign that it was made fresh. Some palak paneer is a darker green, which I believe is a result of overcooking, or has been left simmering in the pot. 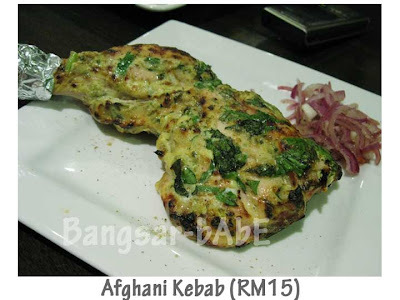 That being said, I’m not sure about other Indian restaurants in KL, but the few I’ve tried tend to be on the oily side. Hope this helps! We'll be going there to celebrate our friend's birthday tonight. 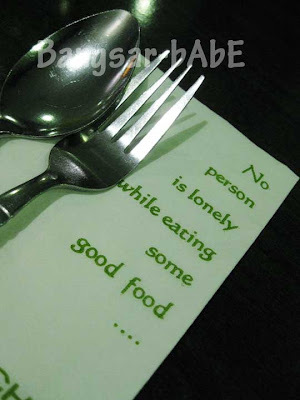 I had been there once and i really liked the Chicken Biryani there, its awesome. we get almost everything that makes a very good destination for Food lovers. I came to Petaling Jaya last week and dont know much about the locality, I stay near Eastin Hotel. 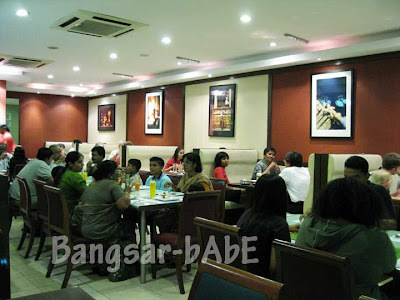 Are there any other resturants like these for South Indian food lovers in KL or PJ. Hi Pavan, I've tried the lamb briyani from Indian Kitchen, and liked it. So I reckon the chicken briyani must be quite good too! It was my first visit to Kuala Lumpur, and thoroughly enjoyed myself ,and Thanks to your blog was able to eat out all the best places.